When left untreated bruxism can lead to loose teeth, insomnia, headaches, frequent toothaches, cracked teeth and earaches. If you’re one of the 10% of American adults who is affected by teeth grinding or bruxism then it’s time to talk to your dentist about treatment plans. When left untreated, teeth grinding can lead to one or more symptoms including not limited to loose teeth, insomnia, headaches, frequent toothaches, cracked teeth and earaches. Depending on your mouth and the severity of your condition, further dental or orthodontic procedures may be advised. Or your dentist might recommend investing in a custom nightguard to protect your teeth from nocturnal grinding. In our post, “Over the Counter Nightguards | Cost-Effective or Just Low Cost?” we took a look at drugstore nightguards and whether or not they are the biggest bang for the Bruxism buck. This week we’re talking custom nightguards–how they’re made and how they perform compared to their store-bought counterpart. 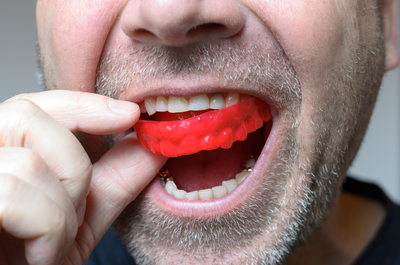 Custom Fit Nightguards are molded from an exact replica of your mouth and teeth. To create a custom nightguard, the dentist takes an impression, an exact replica of your teeth and mouth, nooks and crevices included, that will serve as a mold for your custom nightguard. After taking an impression, your dentist will begin to create your custom nightguard or send it to a lab it’ll be made by layering superheated plastic to precise specifications. As it cools, the plastic becomes a durable piece of thermoplastic. The thickness of the plastic varies from person to person based on the level of teeth clenching and grinding discovered during the initial dental exam. Custom-fit pieces are able to protect teeth at a much higher level because of their shape which hugs each tooth closely and prevents unwanted movement. Custom Nightguards aren’t cheap may not be cheap, but there’s no cutting corners when it comes to your healthcare. We’ll be the first to admit custom-fit nightguards aren’t cheap. We believe though that the unrivaled safety and comfort they provide to their wearers are worth it. Custom-fit pieces are able to protect teeth at a much higher level because of their shape which hugs each tooth closely and prevents unwanted movement. Their ability to be made thicker to alleviate pressure on the jaw is also second to none. When store-bought nightguards lose their shape over time, custom guards don’t. In fact, nightguards from the dentist only require replacing on the occasion of a significant teeth shift or damaged guard. For better or for worse, we’re here for you! At Lake Cities, your health and comfort are our business. If teeth grinding is causing you to lose sleep at night, schedule an appointment with Dr. Moore to discuss what treatment options are available to you, and be sure to review your insurance plan to find out if custom nightguards are covered. No insurance? No problem! Sign up for our awesome Patient Loyalty Program and start making manageable low payments today! We can’t wait to see your smile!